A. Urban renewal is a public financing tool available to cities and counties in Oregon. Using a mechanism called Tax Increment Financing (or TIF), urban renewal directs property taxes on growth in assessed value within an established urban renewal district toward projects that will improve conditions in that district. The driving idea behind urban renewal is that the extra investment, and the expectation of investment, in the urban renewal district generates growth that would not have occured but for that investment. This extra growth is what funds urban renewal projects, and ultimately provides additional tax revenues to the city as a whole. What are the urban renewal districts in Astoria? A. 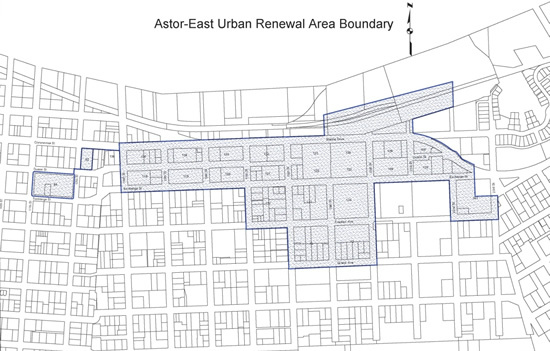 The urban renewal districts in Astoria are called Astor-East and Astor-West and are shown on the maps below. What qualifies an area as an urban renewal district? A. To qualify for urban renewal, an area must be identified by a city council as blighted (which can mean, among other things, underdeveloped, underperforming, dangerous, deteriorated, or poor condition of infrastructure). Blight is fully defined in the Oregon Revised Statutes 457. What are the benefits of urban renewal? A. Through direct investment, urban renewal can help change a blighted portion of a city into a valuable and productive contributor to the local economy. This will help a city in multiple ways. A more vibrant area will draw business, create jobs, and stimulate the local economy. Increased property values will boost local tax rolls after the urban renewal district expires. Improvements to local infrastructure, such as transportation improvements, will make the community safer and will streamline traffic flow to and from the district. How does urban renewal funding work? A. Urban renewal is funded through Tax Increment Financing. When an urban renewal district is established, the county assessor determines the current assessed value of all property within the district, and freezes that tax base. Whatever property tax revenue local jurisdictions receive from this frozen base is the same amount they will receive on a yearly basis until the urban renewal district is terminated. As property values increase above this frozen base, all tax revenues from increases in permanent rates are directed to projects within the urban renewal district. Assessed values can increase yearly at the 3% maximum allowed amount by state statute, or by more than this if new development occurs within the district. This increase above the frozen base is also called the “increment.” When the urban renewal district expires, the frozen base also expires, and the local taxing jurisdictions resume receiving taxes on the full assessed value of the district. What are the steps for creating an urban renewal district? A. An urban renewal district is created through a process that includes community input, notice to impacted taxing jurisdictions, review by a city’s urban renewal agency, planning commission and city council. The city council hearing notice must be sent to a specified group of citizens, that is typically postal patrons. Adoption of a plan must be with a non-emergency ordinance by the city council that does not go into effect for 30 days after adoption. The plan, together with an accompanying urban renewal report, identifies the goals of the urban renewal district and projects to be funded with Tax Increment Financing, describes how the district complies with statutory requirements for blight, projects tax increment revenues, and identifies a maximum amount of debt an urban renewal district can incur, among other topics. The two urban renewal districts in Astoria have both completed this process. Who administers an urban renewal district? A. 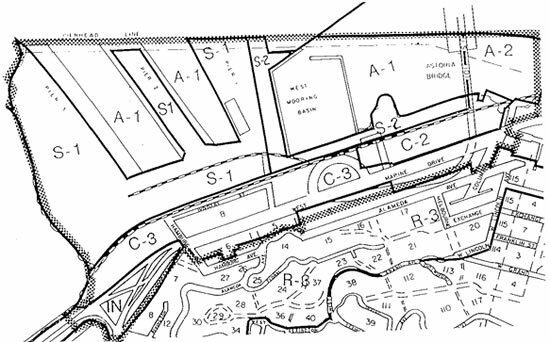 An urban renewal agency administers the urban renewal plan, and this agency is established by a city council. In Astoria, as with many other municipalities, the city council serves as the board of the Astoria urban renewal agency, called the Astoria Development Commission (ADC). A. No, urban renewal does not increase property taxes; it simply allows for the reallocation of growth on taxes to the urban renewal agency rather than the overlapping taxing districts. Taxpayers in Astoria see urban renewal as a line item on their tax statements whether or not they own property inside of an urban renewal district, a situation that can cause some confusion. This line item does not represent an extra charge, or result in a larger tax bill than would otherwise occur; instead, it represents a division of tax dollars, collected from all properties in an amount that equals the growth on taxes inside the urban renewal district. If urban renewal was terminated in Astoria, general property taxes would not decrease; they would just be reallocated to all taxing jurisdictions. The following chart shows a sample $100,000 house in Astoria and the permanent tax rate for the different taxing jurisdictions. The "With Urban Renewal" column shows a sample property 2012 tax bill with urban renewal, for a total bill of $1,609.78. In this example, urban renewal receives an allocation of $121.71. The last column shows what would happen if urban renewal was terminated: the tax bill would be the same, $1,609. However, the allocations to the taxing jurisdictions are adjusted to reflect the total amount being divided differently. Those allocations would be made based on the actual permanent rate of the taxing jurisdiction. A. Urban renewal will have a financial effect on local taxing jurisdictions, but the impact is different for schools than for other districts. An urban renewal district, as explained in later parts of this Q&A document, does not directly affect school districts. Other taxing districts may experience fiscal impacts that limit their total revenue capacity while the urban renewal district is in place. While the urban renewal district is active, a taxing jurisdiction’s revenue from that area will be frozen, and will not increase until revenue-sharing is triggered. So, while an urban renewal district is active, taxing jurisdictions will not receive as much money as they would otherwise have received. In essence, the taxing districts forego some revenue in exchange for a greater total property tax base and revenue capacity as a result of urban renewal investments. The goal of urban renewal is to spur development that would not have occurred but for urban renewal, so when the urban renewal district expires, taxing jurisdictions can expect to receive more tax revenues than they would have had the urban renewal district never existed at all. In 2009, the Oregon legislature passed HB 3056, which enacted what is known as "revenue sharing". Revenue sharing requires urban renewal agencies to share increment when certain thresholds are met. The thresholds are tied to the area's "maximum indebtedness", or the limit on the amount of debt that the agency can incur in an area. The revenue sharing legislation means that successful urban renewal investments begin creating returns for overlapping taxing districts in advance of an urban renewal district’s expiration. This legislation would impact Astoria if either of the urban renewal districts increased their maximum indebtedness in the future. Will urban renewal have a financial impact on the School District? A. Urban renewal will have a negligible impact on the Astoria School District because the money it gives up to the urban renewal district is replaced by the State School Fund. School funding is based on a per-pupil funding ratio from the State School Fund. Increased development resulting from investments of TIF within the urban renewal district will benefit Astoria schools through the construction excise tax on new development which the Astoria School Board and the Astoria City Council put in place in 2011.